Courtesy of Ocean Navi, Tsugaru Channel, Japan. 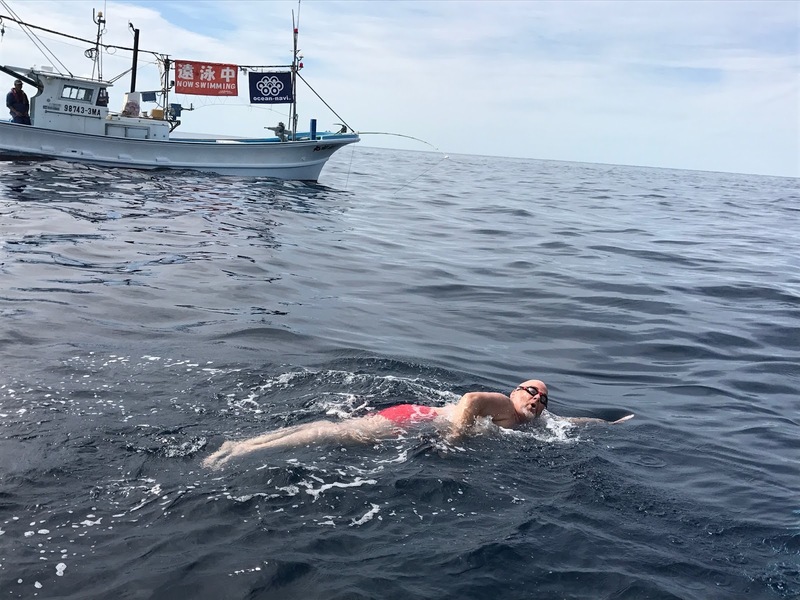 Masayuki Moriya of Ocean Navi reported Adrian Sarchet of Guernsey completed his sixth Oceans Seven channel on August 30th with his 14 hour 2 second crossing of the Tsugaru Channel from Honshu to Hokkaido. 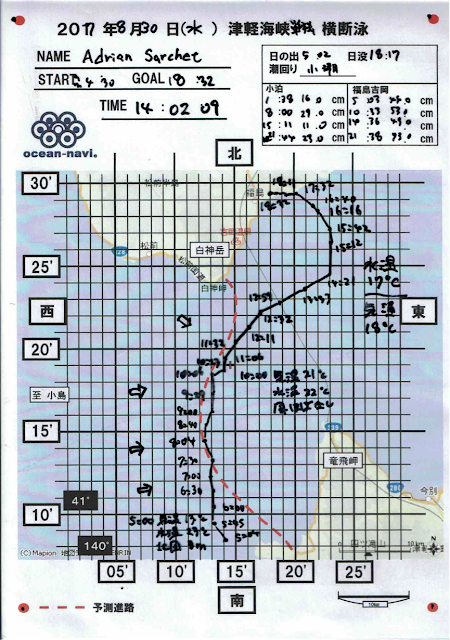 His slow curving course is shown here which indicates he hit a tough, steady west-to-east Tsugaru Current as he approached the finish in Hokkaido. Sarchet talked about another Oceans Seven challenge achieved and more life lessons learned. "This year’s challenge was the 19.5 km Tsugaru Channel between Honshu and Hokkaido in northern Japan. The first lesson we learned was that if you think you have mapped out all the potential risk factors on a swim – newsflash – you haven’t. 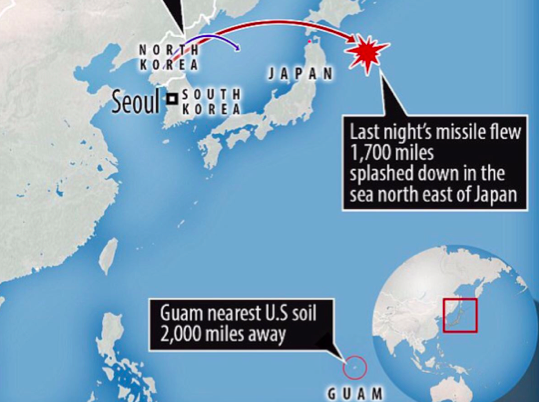 August 2017 marked the arrival of a hitherto unknown swim hazard – North Korean ICBMs. We were awoken the morning before the day of the swim by the Japanese Civil Warning Public Address System which advised us that a missile was passing over the area and that we should take cover in a suitable basement. The second lesson we learned was that despite differences in culture, food and religion, open water swimmers and those that support them are simply good people. 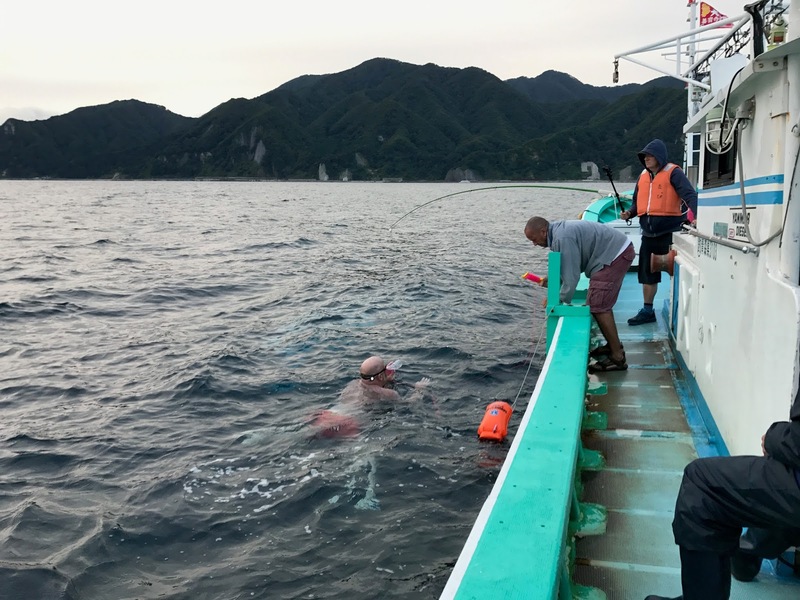 We have been stunned by the generosity of spirit of the Japanese people we have encountered, including most especially observer Masayuki Moriya, Captain Mizushima and the staff of Hotel Tappi. The third lesson was a more personal one for me. That lesson was that you do a marathon swim with the conditioning you’ve got; not the conditioning you’d like. Training had been going incredibly well until mid-June when I was struck down by extreme stomach pain, lost 10 kg in body weight in two weeks and ended up having a week in hospital including keyhole surgery on my stomach. I lost a month’s training at a critical time and doubted whether I’d be able to complete the Oceans Seven at all, let alone complete Tsugaru nine weeks after surgery. Even as I lost my own faith in the project, my wonderful wife and crew kept theirs. Over the following weeks they nursed my body, then my mind and finally my swim confidence back to health. 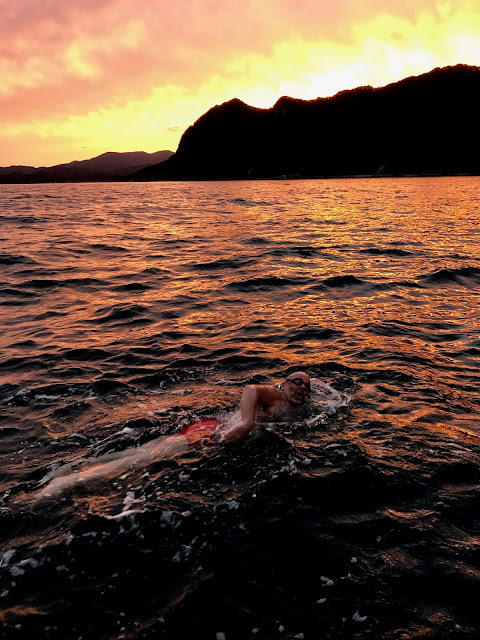 I was nowhere near where I wanted to be in terms of conditioning, and in possibly the worst shape I’ve ever been in approaching the date of a marathon swim. But my crew and I knew it just might be possible to grind out a successful swim. The swim itself turned into just that...a grind. The first few hours of the swim were in choppy, sloppy water, but I was fresh enough to batter my way through it. 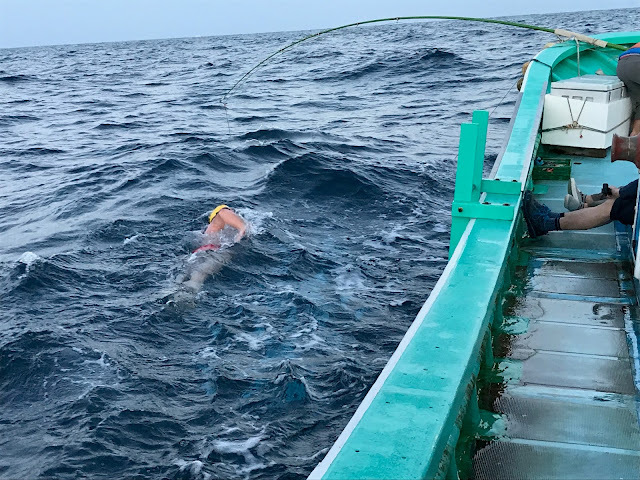 We then had a few hours of calm seas and I got into my rhythm and covered some good distance. Then we hit the current that Tsugaru is famous for. It was running east to west at about 7 kph. Trying to cut a 7 kph current when my maximum speed is 3.5 kph was a nightmare. I just didn’t have the speed to cut across the current and hit the targeted landing zone. 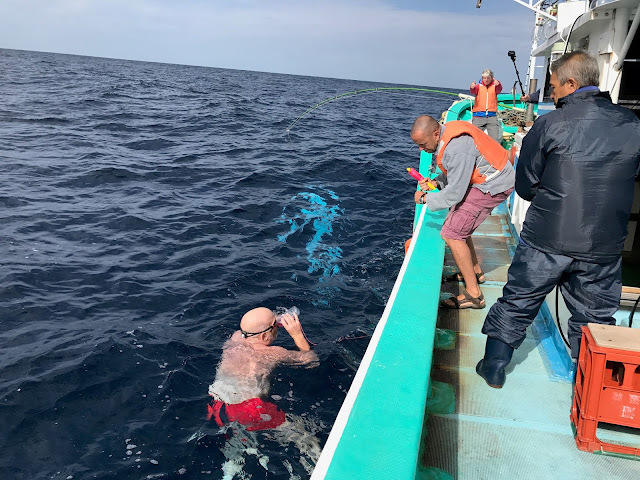 What followed was something of an ordeal as my crew motivated me to keep swimming at maximum pace hour after hour until we finally reached the outer edge of the current zone. I exited the current zone absolutely exhausted and could see the coast of Hokkaido ahead of us, I just didn’t appreciate that it was still a good 10 km away. My crew wisely informed me that we’d cleared the current and that if I could grind it out, we’d get there. And grind we did. Finishing hours later in a time of 14 hours 2 minutes 9 seconds. Marathon swimming is a solo event; but a team pursuit. 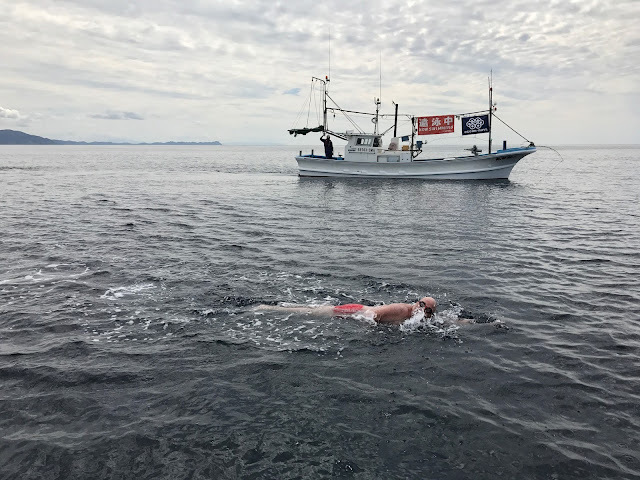 And once again I owe my success on this swim to my sea crew of Pete Rowland, Mandy Mackelworth and Simon Davies, to my land crew of Andrea Sarchet-Luff, Ine Davies and Anna Davies, and to the Guernsey Swimming Club. I owe a debt of gratitude to all."